Enhance your outdoor living space, enhance your life. Concrete Pavers can be beautiful additions to your Orlando hardscape, and their advantages over concrete and asphalt go far beyond their good looks. Properly installed pavers provide an excellent non-slip surface for walking, bicycling and driving. Orlando Pavers can even be removed for irrigation or utility repairs and then replaced, retaining their original appearance. Standard paving stones provide a wide range of styles, colors and textures for patios, sidewalks, driveways and more. Permeable pavers allow the passage of rainfall, filtering and cleaning runoff while reducing storm drain impact. Turf pavers stabilize soil, reduce erosion and can create a grassy space for overflow parking or vehicle access in landscaped areas. Paving stones mimic the look of natural stone while adding an incredible variety of shapes, colors and textures. Expand your hardscape color palette and complement your creativity! 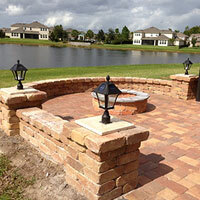 Whether your style is relaxed or energized, Orlando pavers can create an ambience that is all your own. 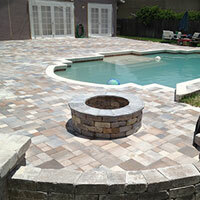 HOW MUCH DO CUSTOM PAVERS IN ORLANDO COST? 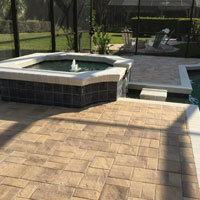 At Orlando Discount Pavers, we believe in transparent pricing which is why we are the BEST PRICED PAVERS in Orlando. A customer shouldn’t have to be a professional hostage negotiator to get a fair price for their pavers project—that’s what buying a used car is for. Since every project is different (access, conditions and custom work), we provide further on-site inspections to generate final price quotes, at absolutely no cost to you. Our pavers and installation techniques are top notch. We strive for perfection and customer satisfaction, which is why we offer a 12 month warranty on everything that we do. Ready to design your dream? Call us today for your free estimate and design consultation. 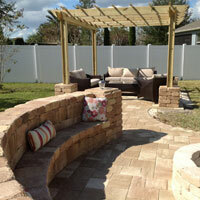 We install beautiful pavers in Orlando at a great price without sacrificing quality. Pavers look amazing on a patio, driveway or under a pergola. We provide pavers in many different sizes, colors and styles to match your home and unique taste. Thicker pavers are generally used for driveways while thinner pavers can be used to patio areas and outdoor kitchen areas. Orlando Discount Pavers can assist you with the design of your patio or driveway and provide a complete estimate to help you to achieve the dream paverscape that you desire. 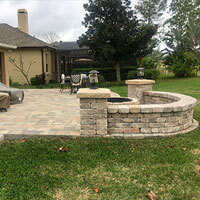 Ready to modernize your yard with pavers? Give us a call. Pergolas add value to any property. A well designed and constructed pergola can provide shade to any area that you wish, around the clock! Our pergolas are hand built to your specifications. Many clients prefer to build a pergola by their pool or over an outdoor kitchen area. 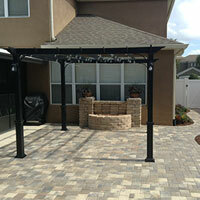 Pergolas can also provide shade to seating areas to avoid the hot Orlando sun. Our pergolas come in many different sizes and designs so check out our portfolio for pergola ideas. What aspiring chef or grill master doesn’t want their very own outdoor kitchen complete with grill, sink, cabinets and plenty of counter space for entertaining guests and family. Our outdoor kitchens are hand built to match your needs and style. 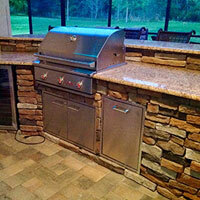 How about a beautiful granite countertop and stone veneer to accomodate the built in high BTU grill and side burner. 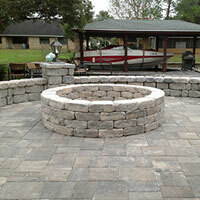 Maybe add a corner area for a green egg or incorporate a firepit into the design. Check out our portfolio section for some of our recent custom outdoor kitchen designs.